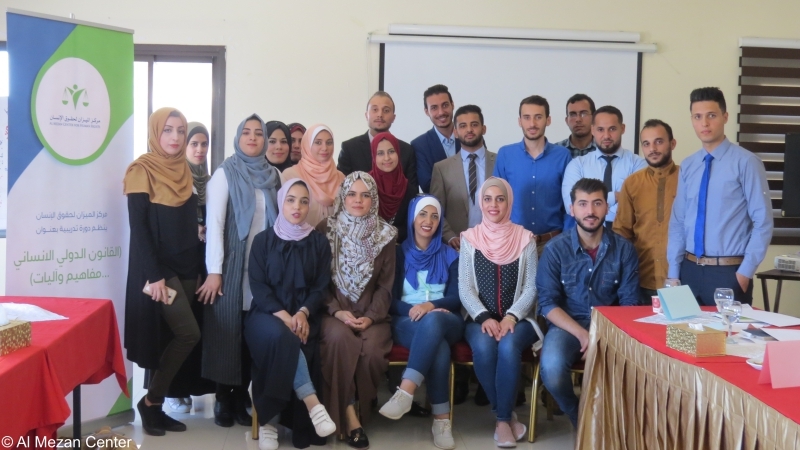 Gaza City – Al Mezan Center for Human Rights has held a three-day training workshop on international humanitarian law (IHL) for 20 lawyers, ten of them female. The workshop was organized at Gloria Hotel in Gaza City between 28 and 30 October 2018. Inaugurating the workshop, Mrs. Shirin Al-Shobaki, the Coordinator of the Training and Mass Communication Unit at Al Mezan, welcomed participants and briefed them about the importance of gaining familiarity with IHL’s essential principles of protecting women and children in contexts of armed conflict. Ms. Al-Shobaki expressed hope that participants would be enabled to bring to their legal work their newly-gained knowledge as well as to pass it to their colleagues. Throughout the three training days, participants were introduced to IHL and human rights standards, and they were engaged in discussions of monitoring, documentation, and reporting tools relevant to the goal of the UN Security Council Resolution 1612 on children and armed conflict. The training also covered the special protection of women and children under IHL. At the end of the workshop, participants had an opportunity to develop their understanding of the responsibilities of Israel as an occupying power towards the Palestinian population. The session was a part of Al Mezan’s project, “Protection and Promotion of IHL in Gaza”, supported by Diakonia.